In the wake of the Sony Pictures hack and recent cyber-threats, The Interview has been cancelled just before its North American launch. Update: Almost immediately after posting the original story, Sony Pictures announced that it's officially cancelling The Interview's North American launch. "We have decided not to move forward with the planned Dec. 25 theatrical release," Sony said in an emailed statement. "We respect and understand our partners' decision and, of course, completely share their paramount interest in the safety of employees and theater-goers." Original Story: Sony Pictures has been in the news quite a bit lately, thanks to a cybersecurity breach that revealed all kinds of disappointing, behind-the-scenes movie info. But a potentially darker side of the story arrived yesterday, when hackers threatened to attack any theater that airs Sony's upcoming film, The Interview. Whether the threat itself is legitimate or not, it's concerned several major theater chains enough to delay or drop The Interview a mere week before its launch date. "Due to the wavering support of the film The Interview by Sony Pictures, as well as the ambiguous nature of any real or perceived security threats, Regal Entertainment Group has decided to delay the opening of the film in our theaters," Regal Entertainment said in a statement to Deadline. While Sony still plans to release The Interview for the original release date, it's halted TV advertising and offered theater owners the option of stepping back from the film. And film chains are certainly taking Sony up on that: Outside of Regal Entertainment, AMC Entertainment, Cinemark, Carmike Cinemas, and Cineplex, and other chains have dropped The Interview. On top of everything else, The Interview's NYC premiere has also been cancelled. We will clearly show it to you at the very time and places 'The Interview' be shown, including the premiere, how bitter fate those who seek fun in terror should be doomed to. Soon all the world will see what an awful movie Sony Pictures Entertainment has made. The world will be full of fear. Remember the 11th of September 2001. We recommend you to keep yourself distant from the places at that time. (If your house is nearby, you'd better leave.) Whatever comes in the coming days is called by the greed of Sony Pictures Entertainment. All the world will denounce the SONY. 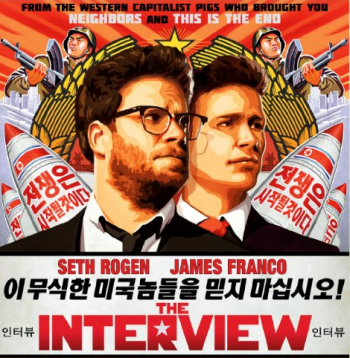 The Interview is the latest comedy from Seth Rogen and James Franco, where the actors play reporters hired to kill North Korean leader Kin Jong-un. Many suspect the Sony Picture hack itself, and by association this cyber-threat, was an orchestrated response by the North Korean government. While that's not confirmed, it's certainly damaging other film projects about the nation: A planned North Korean "paranoid thriller" starring Steve Carrell has already been cancelled.